Macula a central part of retina responsible for central and sharp vision degenerates with advancement of age causing central vision loss. Macular degeneration, ARMD (Age-Related Macular Degeneration), is the leading cause of vision loss and blindness aged 65 and older. Yellowish spots (drusen) that form in the back of the eye or retina can be an early sign of "dry" macular degeneration occurs. Abnormal blood vessels and leakage in the back of the eye (retina) affecting the macula where fine focusing. The diagnosis of macular degeneration is made based on a thorough eye exam. Following diagnosis, additional tests may be performed to determine the location and extent of the disease. The doctor looks for presence of abnormalities in the macula, such as deposits called drusen. In addition, the appearance of the macula is important to sharp central vision — if the pigmentation is mottled or uneven, instead of its normal even reddish color, macular degeneration is usually the cause. As a part of the eye examination, the physician may evaluate the patient's vision using a printed grid. 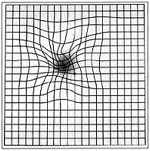 If macular degeneration is present, the lines of the grid may seem faded, broken or distorted. 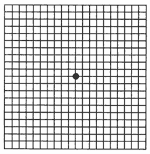 By noting where the distortion occurs (usually near the center of the grid), the doctor can better determine the location and extent of macular damage. This test perform to determine the extent of the damage from macular degeneration. A special dye inject into a vein in the patient's arm, as the dye circulates through the bloodstream and eventually to the eye, the blood vessels in the retina stand out as bright yellow when observed with a special blue light. A camera takes flash photographs of the eye every few seconds for several minutes, which help the doctor determine pigmentation changes or abnormal blood vessels. The ophthalmologist numbs the eye with an anesthetic, the drug, called AvastinTM or LucentisTM,is injected into the affected eye. The medicine stops or slows the blood vessels from growing, leaking and bleeding. Also known as laser treatment, photocoagulation uses a high-energy laser beam to create small burns in areas of the retina with abnormal blood vessels.